I Love You More Than Carrots: I Confess: I Hoard Skin and Beauty Products Like Whoa And Now I'd Like To Give Away Some Recent Favorites. I Confess: I Hoard Skin and Beauty Products Like Whoa And Now I'd Like To Give Away Some Recent Favorites. I think it's safe to say that the bathroom cabinets in both the master bath and guest bath as well as the bottom two shelves of our linen closet could give any beauty supply store a run for their money. In fact, I might as well run a black market for skin and beauty products out of the basement playroom. There is no doubt I could make a killing. If you're anything like me, you can't pass up a great skin care product. I learned at an early age to take care of my skin and although I don't always heed those wise words of my mother (read: wash my face each night before bed) I am a sucker for a good eye cream, tightening facial moisturizer and hydrating hand lotion. Let's face it. Not only do I want younger looking skin but I'd like for some pretty little young hands to match. Nothing skeeves me out more than wrinkly, dark spot-laden old lady hands. Am I right? Recently I had the chance to review some delicious beauty and skin care products from European skin care maven Estrea. As explained on their website, "since its proven success in the mid 90s, Estrea’s Skin Care System has been the number one choice of European women. 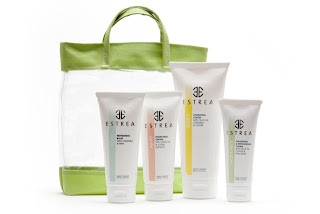 Now, for the first time, the Estrea product line is available to the U.S. market, so that American women can experience the benefits of Estrea’s unique European Skin Care System." Further, "Estrea’s twelve cleansing and moisturizing products for the face, hands, body and feet, bring together modern science and the restorative properties of nature to create a rejuvenating skin care regimen. The line’s most popular products, the fast-absorbing hand lotions and creams, have been proven to promote fingernail growth. The natural ingredients in Estrea include aloe vera, collagen, coffee, olive oil, citrus extracts, chestnut and Vitamins A, C, E and F."
I don't know about you, but I love when I can look at the ingredient list on a favorite beauty product and right away recognize and pronounce the product's key ingredients. 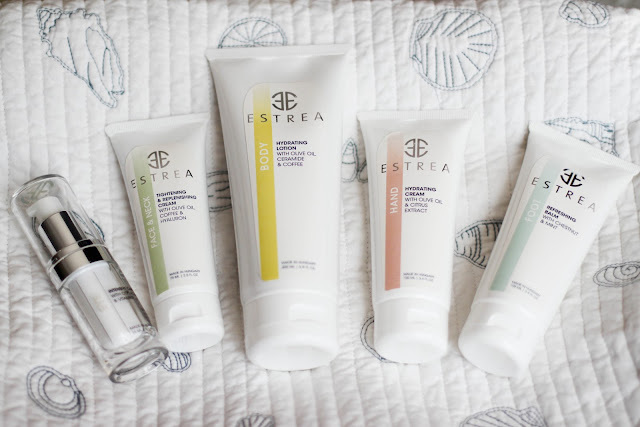 With additives such as olive oil, coffee, chestnut, mint and citrus extract- Estrea's various lotions for both face and body have become a staple in both my morning and night time beauty regime. My most favorite Estrea product is the Intensive Eye Care cream with collagen and vitamin E. Within seconds of dabbing it both beneath my eyes and above the crease, I can feel the eye cream begin to tighten the delicate skin around my eyes. With a light refreshing smell and non-greasy feel, it goes on easy and isn't something that I mind putting on my face before bed each night. Something else that I just adore about this cream is that it isn't by any means runny. I like a good weight to my eye cream and although this cream isn't runny or watery, it goes on thick and absorbs perfectly. 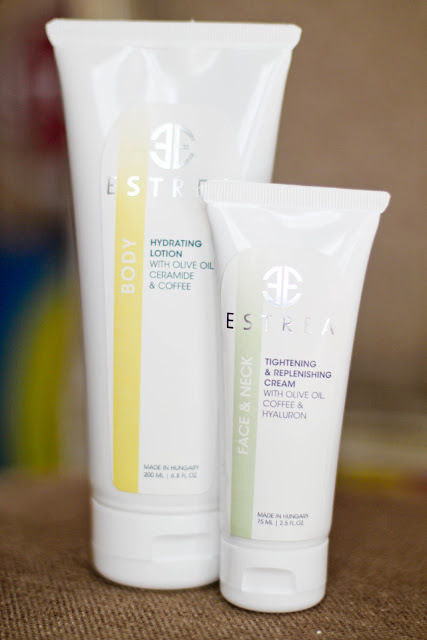 Estrea's hydrating Body Lotion and tightening Face and Neck Cream have also become quick favorites of mine. While the skin on my pregnant belly grows tighter and tighter by the day, just a dime-size amount of the hydration body lotion keeps those annoying "itchies" at bay. Once again, the lotions go on clean and light and don't feel slimy or gross beneath my clothes. The addition of caffeine as a main ingredient in Estrea's face and neck lotion is known to increase microcirculation, both protecting and nourishing the skin stressed by environmental damage such as the sun. 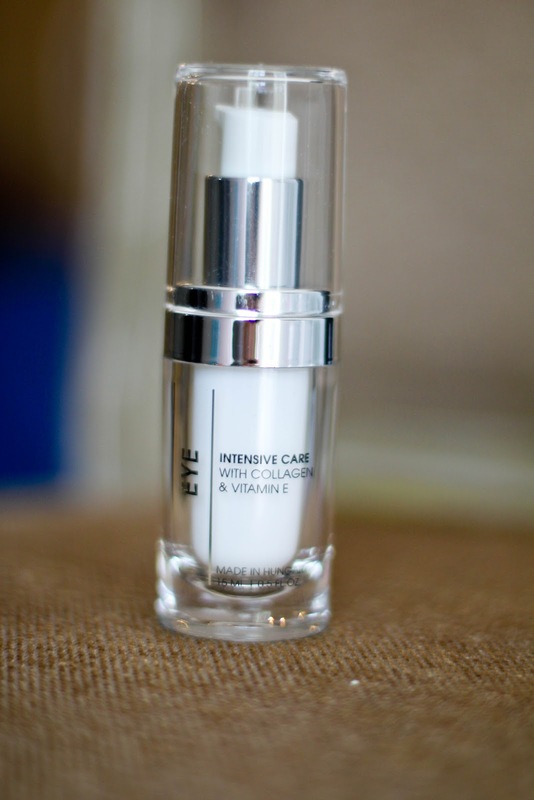 It also serves as a great hydrating base applied before putting on the day's make up. 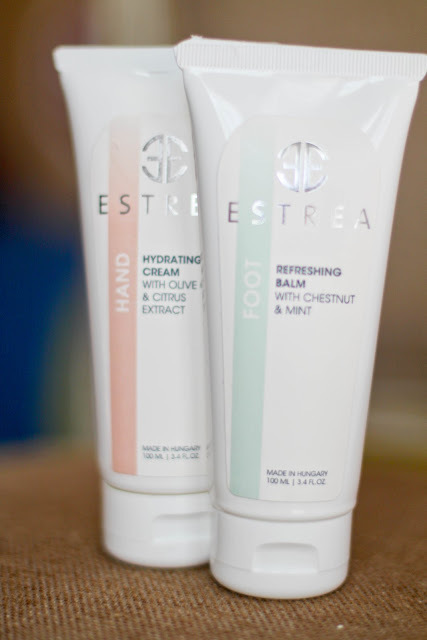 Last but certainly not least, Estrea's Refreshing Foot Balm is absolutely note-worthy. It's yummy minty aroma is both refreshing and cooling when applied to tired, overworked tootsies. Say, feet that have spent all day chasing around a Crazy Toddler Wildebeest. I've even noticed that by the end of the day, once applied, Estrea's refreshing Foot Balm even helps to reduce some of the mild swelling brought on by the day's events. All in all, each of Estrea's unique and proven body care products has been a welcome addition to this Mama's medicine cabinet. I've really enjoyed using these products on a daily basis and am excited to partner with Estrea to give away 1 complete Body Care and 1 complete Face Care set. The winner can choose if they'd like the oily skin or the dry/combination skin option. Use the Rafflecopter widget below to enter! With multiple entries and the ability to tweet daily about the giveaway, there are many, many chances to win! Thank you, Estrea, for providing me with such a great product to review and share with the readers of I Love You More Than Carrots. For those of you who cannot wait until the giveaway winner is announced, EstreaUSA is currently offering Free Shipping on all orders!! Lastly, every person to follows Estrea (@EstreaUSA) on Twitter between now and April 15th will receive a $5 store credit to be used towards your favorite Estrea product! I LOVE product! I'd happily never wear make-up again if I could slather with serums all day:). Moisturize and wash nightly. And don't smoke. And hydrate. That's all I've got. Sunscreen! And always wash you face before bed! Easy!! Pick Me Please! Since I did not win Mega Millions, well, I could use a win! Where was this stuff 3 years ago when I was pregnant and itching like crazy? Sounds like I would love it! I love sunblock and always wash my face before bed and right after working out! My secret is to use all oil-free products! Love this giveaway! My secret is to use a moisturizing face wash...my skin is super dry and it shows if I don't use it! I don't really have a face secret. I wash my face in the shower and wear sunscreen - That's it! That and I rarely wear ANY make-up ever. I did use a mud mask the other day! Oh WOW that was amazing. Luckily I have never had issues with my skin - until now, pregnancy hormones have caused a break out or two! Sunblock is extremely necessary living in Phoenix! Always wash your face before I go to bed! I have recently learned that staying away from tanning beds is just as important as they say it is! My friend and I used to go all the time in high school, I stopped going several years ago and she didn't. You can definitely tell because her skin looks like leather at 26! I really don't think I have any secrets. I'm pretty simple. Oil of Olay face wash and moisturizer every day! I don't have any beauty secrets. I've been looking for a great skin care product for a while now. I always do moisturizer with sunscreen! Most important not-so secret: Wash your dace every night, and water, water, water! Drink it like it's your job. I never leave my makeup on and always wear sunscreen! Always take my makeup off at the end of the night and wash my face! Don't drink soda. WATER water water! My best secret is to always wash my face before I go to bed at night and use a moisturizer with SPF everyday! Love this giveaway! I love moisturizers with SPF! I recently picked up the Olay Pro-X Brush and it's magical. It's just like the clarisonic but for a fraction of the price. My skin LOVES it! wash my face before bed and moisturize.. heck i'm in high school i have no clue! ALWAYS wash your face before going to sleep! Hi AP! I put on Vitamin C EVERY DAY - rain or shine - under my SPF moisturizer. Supposedly if I keep this up I'll never need eye cream - yeah right! I too am a hoarder of skin products and makeup. I just have to try it all! wearing sun block. Have had two cancers removed from my face, so I never leave home without it. When my skin is really dry I put vaseline on it at night....really helps moisturize! Fifty Shades... Of A Good Read. I Can't Help But Wonder Who Will He Look Like? I'm Pregnant, Stop Hitting On Me You Weirdo! Scentsy, Stella&Dot and Thirty-One Fabulous-ness! Attention All Baby Mamas! Something For Everyone! Parenting Fail #572 :: Balls. ... The First Official Pre-M2 Freak Out.